this stone built pension is located in the centre of Goreme. Stay In Peace Cave Hostel offers cave rooms, it is a cave hostel. We don't have a kitchen but n the mornings traditional Turkish breakfast is served. Guests can have local information from the tour desk at Stay In Peace Cave Hostel. Daily Cappadocia tours or hot air balloon rides can also be arranged by the staff of Stay In Peace Cave Hostel. Welcome drink, 24 Hours hot water (shower), Open throughout the year, Airport Pick-up service available, Laundry Service(charged), Free Wi-fi internet, Free Information about Cappadocia, Free Cappadocia Map. Just 500m-walk to the sunset/sunrise view point. Local cuisine can be enjoyed at the terrace restaurant, with beautiful views of Cappadocia's natural surroundings and the nearby villages. The bus terminal of Goreme is only 800 metres away. Nevsehir Airport is 35 km away. 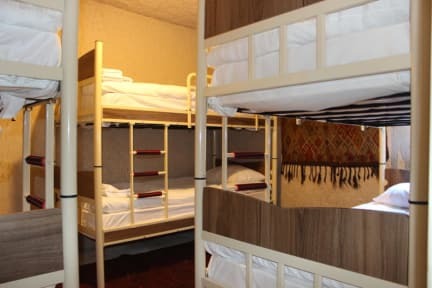 We have Dormitory Rooms Only. All rooms are decorated with traditional bedding and curtains. Rooms are shared bathroom and toilet. I stayed here for three days, everything was good. The location is great, I loved that it is a relatively small hostel and you'll get to know everyone pretty fast. The owners do there absolute best to have everything arranged for their guests and to help them where they can. Only downside, in my opinion, are the animals which are kept as pets. It's just really (really!) sad to see turtles and birds being kept in cages and tanks like that. Really enjoyed staying at the hostel! The couple who runs is very nice and helpful! They can give a lot of advice to make the best of your stay in Cappadocia. The Location is really good for exploring the stunning surroundings and yet quite! Since the hostel is rather small, it is easy to get in touch with all the other travelers. We loved our stay in Cappadocia! Especially with help from hostel owner at stay in peace cave hostel. He was extreemly accomodating and very helpful in booking unforgetable trips in Cappadocia. Breakfast was delicious, beds very comfortable and the room nice and tidy. The atmosphere at the hostel was great! Would defenately visit again! Thanks again so much! Ein sehr familiäres Hostel mit perfekter Lage im Ort, abseits der Hauptrassen. Das Paar welches das Hostel leitet ist enorm hilfsbereit und sehr freundlich. Sowohl die Betten als auch die Badezimmer sind für ein Hostel überdurchschnittlich sauber. Sehr gerne wieder! Nice staff! But I think the hostel needs some cleaning and clearance. There is so much stuff everywhere intended to be decoration but it's not very well kept. There a some pets in the hostel. 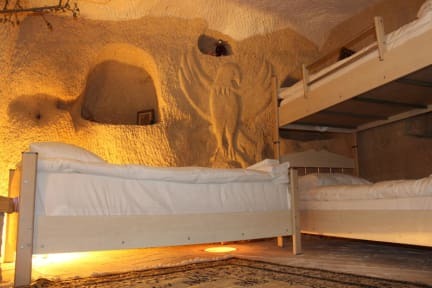 I think there are better places to stay in Göreme. But the cafe/restaurant which is on top of the hostel is really nice!